This is an author requested review. Jayanand Ukey works for an IT company and is also a freelance journalist and blogger. This book is his first published work. “A global ordeal, a couple in distress, a struggle to keep afloat, prudent thinking in tumultuous times”… well, that’s how the author begins the blurb at the back. The plot revolves around Girish and Prajakta, who are in love and just out of college. Both of them have got placed in big IT companies and are looking to settle into their jobs before breaking the news to their parents. However, the parents come to know of their relationship somehow and both of them have to think on their feet to make the parents meet and convince them to agree to their marriage. When their life seems back on track, fate intervenes and they’re split. The story afterward looks at their struggle to make their love a success. There isn’t anything complex in the plot. It’s a simple love story, and a light read that you can get through easily in a couple of hours maybe three tops. It makes a good book for reading during travel, which is what I did, as I finished the read on the way back from work. The author being part of the software industry might know of the aftermath of the receding economy on the industry, and this has come out well in the story. (I still can’t forget my own experience of that… brr!) Even the first dreams of the future after the campus recruitment of the protagonist Girish is quite nicely thought of. On the whole, the plot feels very filmy. To a large extent, it is very predictable too. Couple in love, parents against it, then for it, then when the tide turns, they go against it again, a villain enters the scene, the hero starts to fight for his love… it leaves me kind of flat. Maybe it isn’t the plot, but the pace. Everything seems to be zooming. The guy and gal are already in love to begin with, and then circumstances make their plans for marriage to speed up even more. The “how they fell so deeply in love with each other” aspect doesn’t seem to have gotten that much attention. A lot of thought is there in the book… I mean the repetition of these phrases… “he thought” “she thought” “this came to mind”. There aren’t characters from outside the two families and the “villain” family. I felt there were many typos or other errors spread throughout the book, some of which come at points that where the pace of the narration is just beginning to develop so it becomes more noticeable. Though the story is also about the couple’s fight against the economy, there is a lot more description of that than is actually necessary. The ending part I feel is very hurriedly written, and somehow didn’t quite hold water. It was a terse and abrupt conclusion, as if the author just wanted to get it over with, and took the short way home. 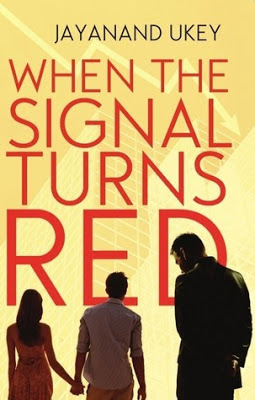 I also feel “When the signal turns red” to be an odd title choice, when the signal incident comes just once in the story and nothing very significant happens at that point of time. There is no metaphoric link to the story that I could find either. When the signal turned red, I felt like stopping to read. A light read, perfect for reading if you have to travel for an hour or two. Nothing too complicated to understand in language and plotting, the former being a positive point and the latter a mix of both, since we’re left a little flustered at the very quick pace and hurried ending. i do need to read a light read now and then. might give this a go.